Legendary guitarist, songwriter and singer Eric Clapton was in our studio today to discuss his revealing new book, Clapton: The Autobiography. 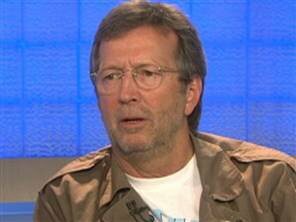 Before the segment, Clapton was gracious enough to sit down with me for a few minutes to answer a few of my questions. Among the subjects we discussed: which of his bands he wishes had stayed together longer, who he's listening to now, and which of his songs he'd put on his iPod. Q: In the book, you spend a lot of time talking about some of the downsides of fame...but what has been the best part about being a rock star? Eric Clapton: Well, the music, really. Being able to make music. I don't really know what a rock star is, actually. I don't really feel like I am. I'm a musician who plays, not necessarily rock and roll. So I don't really fit, I don't think, in that box, to be honest. But a lot of the time, it really is a setback. I suppose the best thing is that I can probably get into a restaurant. It's the very simple things that probably anyone would answer if they considered themselves a celebrity or a rock star. That's about it, I would imagine. Q: For all the bands you were in over the years...is there any one that you look back and say, "I wish that one had stayed together longer, had continued to make music"? EC: I think Blind Faith was over too soon. We could have gone on maybe a couple more years. I'm not really a band member. I think all of those bands probably lasted about the right amount of time for what they were meant to do. Q: You talk in the book about the paradox of not necessarily being ready to be a bandleader, but your ego was too big for you to be a sideman. Is that something that you were aware of at the time? Or did that realization come with a more mature perspective later on? EC: I'm not sure if even that is right, because what would conflict it is tying the party line with what I wanted to do, with my personal vision. The element of compromise required to be in a cooperative band. Or even to be in a band where someone else was the leader and I had a definite idea of the music I wanted to play, there would be the conflict -- that balancing sort of method of balancing the pros and cons of whether I wanted to stay and swallow what I wanted to do for a while. But I always had in the back of my mind that I would have to leave and pursue my own personal journey. Q: Around the time that you were with the Yardbirds, you were kind of unimpressed with the Beatles early on, unimpressed with Dylan early on. What kind of a guy were you back in the mid-1960s, and, aside from your sobriety, how are you different now? EC: I'm not very different at all, actually. I'm pretty much the same guy, I've just tried to temper it with what I've learned from trying to grow up and from being sober. The same thing we were talking about before would supply me with a certain amount of arrogance. The notion that I knew what was right and wrong musically. And that that notion was somehow better than anyone else's. And what I would confuse that with was the purity of my vision. It wasn't a question of what was right and wrong. In bands like the Yardbirds, it was fine when we were all going in that direction -- and maybe that was the direction I wanted to go in. But when fame and being like the Beatles, or having that kind of thing, became too tempting, I was the one that found it easiest to turn away from temptation. I had a definite idea of where I wanted to go. Q: And yet, as it turned out, you became bigger than any of those other guys you played with at that time. You were the one who approached the fame of the Beatles, the Stones, Bob Dylan...Does that strike you as ironic? EC: It does and it doesn't. It sort of strengthens my resolve in terms of pursuing my dream. I think anyone who pursues their dream without compromise will get to that place. There were times in all of these situations when there was an element of fear or regret about whether I should leave or disband. Now I feel like I probably did the right thing, but I don't know. I'll never know. Q: At the end of the book, you write, "The systems of marketing and distribution are in the middle of a huge shift, and by the end of this decade I think it's unlikely that any of the existing record companies will still be in business." So where is the music industry heading? EC: I don't know. The whole thing about the Internet is worrying, because it's such a fragile medium. It can break down or it can fall into the wrong hands. I think it's gonna be another 10 years before something more reliable evolves with satisfaction. At the moment, the people that are making the most of it are people that have already made their bones and don't need it as a source of income. They'll be able to make money from touring. People that haven't got any kind of reputation and still need to break through aren't going to be able to fall back on that as a way of making a living. The idea of free music is a sort of scary notion. It's all right for me. I don't know where I'm gonna go either. But in a way, it's quite a lot more comfortable for me because I always believed the to be the ideal way to make a living. Records were always an odd phenomenon for me. In a way, it's almost come to the end of its life. I don't know how it will go forward from here. Q: You mention in the book how the Internet has helped you build a big digital library. I know this is basically an impossible question, but if you had to pick one of your songs to put on your iPod, which would it be right now? EC: Very tough one. I suppose something from Pilgrim. I mean, "Pilgrim" is one of my favorite tracks. It had just about everything I'd want to do. If I was gonna go make a record right now, what kind of record would I like to make? Pilgrim with a live band instead of computers. Q: Who are you listening to right now? Any up-and-comers? EC: I just bought the new Babyface album, which I think is a phenomenal record. The new Joni Mitchell record. I kind of scan around for new stuff, but most of the young musical bands play pretty much the same to me. There's not a lot of really interesting stuff coming from young people, I don't think. I still look back to the past. Q: I don't know if this is the kind of thing you sit around and think about, but what separates great guitar players from the truly elite? Is it practice, is it luck, or is it something innate? EC: Well it's not luck. We can do a process of elimination there. It's definitely not luck. Luck has more to do with becoming famous, like being in the right place at the right time. But it's mostly hard work. There is an innate gift, I believe, that we have to have been given something to begin with that we need to develop. That can be genetic, can be spiritual, I have no idea. But I think the key part of it is work and being true to yourself. Q: Another thing I took from the book is that you hardly ever write about the business side of things...how many albums you were selling, how many tickets you were selling. There have been so many artists who have faced financial ruin when going through personal turmoil, yet you were able to keep things together. How did you manage that? EC: I'm a good businessman! <laughs> Someone once told me that, and it came as a real shock, because I have no idea how to account. I have no idea of how the financial side of it works. But part of being a good businessman is knowing when to make the right move or knowing when to hold things in check. It's timing. I always knew when I was getting on the edge of getting into real trouble, and I would figure out what I needed to do to get out of it, to keep the walls from the door. Q: So you were able to keep the business side separate from the personal side when the personal side was going haywire? EC: Well, yeah, but I mean business side in a much more abstract sense, meaning it's more like a survival technique than a survival approach. It's an intuitive thing to know, I need to stop doing this and get on with that. Q: Looking back and going through this whole process of going over your life, what sticks out to you as a particular thing you would go back and change if you could -- if anything? EC: If anything. I mean, if you take any one piece out of the puzzle, it doesn't work. The obvious thing that comes to mind that's attached to so much regret was that I would have stopped drinking or doing drugs a lot earlier, when it was still an easier option. But there was that point where you realize -- or at least I realized -- I couldn't. It would have been nice not to have got to that stage. But then I wouldn't have what I have now. So any of the great things I have in my life are all part and parcel of what I went through. None of it can be undone, so I don't really suppose I would change anything.